Daughters of the Dust is a poetic film, which might turn off those who are looking for a more straightforward narrative film. Its dreamlike quality is what elevates the film, though warning's fair: it may be too poetic for some. A plot summary is a bit hard given that Daughters of the Dust has a nonlinear structure. Essentially, on Ibo Landing on the Sea Islands of the South in 1902, a gathering of the Peazant family takes place. The daughters and granddaughters of the formidable matriarch Nana Peazant (Cora Lee Day) gather, each with a decision to make. They can either remain on Ibo Landing and maintain the Gullah way of life or 'go North', essentially join the mainland and the culture they have been isolated from. These women and their men have kept themselves free despite the Civil War having ended less than a generation ago thanks to their isolation, the Peazants descendants of those enslaved Africans who either washed upon the Sea Islands or escaped to its protection. Some of Nana Peazant's granddaughters and graddaughters-in-law have already lived on the mainland, but others have remained. Nana Peazant is too tied to the traditions of her people to leave, but her descendants are not. There is Viola (Cheryl Lynn Bruce), the devout Christian who has brought photographer Mr. Snead (Tommy Redmond Hicks) to chronicle their gathering. There is Yellow Mary (Barbara O), an elegant woman of the world who comes with her lesbian lover Trula (Trula Hoosier). There is Haagar (Kaycee Moore), Nana's granddaughter-in-law who pushes to go up North. And then there's The Unborn Child (Kai-Lynn Warren), who speaks via voiceover. She speaks of her ancestors and descendants as the extended Peazant Family each make their decision about keeping to the old ways or going to the new. Daughters of the Dust is more a visual poem than a film, a movie that is more like a dream than a straightforward narrative. Writer/director Julie Dash gives us a meditation on a variety of themes: the connection between past, present and future, the struggle between holding on and moving forward and the everlasting link from one generation to the next. This is best captured by the connection between Nana Peazant and 'the Unborn Child' carried by her granddaughter-in-law Eula (Alva Rogers), who may or may not be her actual great-grandchild due to Eula having been raped off-screen when she was off the island. Nana makes a declaration about herself and The Unborn Child (who does appear in visions from time to time, once startling Mr. Snead when taking a photo of the Peazant men). "I am the Last of the Old, and the First of the New", referring to both of them. That interconnection between the generations is a powerful theme in Daughters of the Dust, the importance of keeping the legacy of the ancestors and the cost of their freedom both physical and personal. "Respect your elders. Respect your family. Respect your ancestors", Nana speaks in voiceover. To Nana and the film as a whole, 'the ancestor and the womb are one and the same'. Daughters of the Dust also seems to cover the wide scope of the African-American experience through the various women. There's the 'progressive' modern thinker who has little patience for 'the old ways' or what she sees as superstition (Hagaar). There's the fervent and devout evangelical who loves her family and roots but struggles to balance the two (Viola). There's the woman who lives unapologetically to seek out her own freedom (Yellow Mary). This is a female-centered film, as the men are almost always on the sidelines. There are men in the film, but they seem to be almost always outsiders ranging from the true outsider Mr. Snead to Bilal (Umar Abdurrahamn), the only practicing Muslim on Ibo Landing whom even Nana sees with suspicion. Dash has a visually evocative, meditative style in her film, with Arthur Jafa's cinematography creating that dreamlike quality. There is slow-motion and scenes that echo traditional images of baptisms and an almost mystical connection to the land and each other. John Barnes' score is also exceptional: a mix of the ancient and modern. Dash also draws elegant performances out of her cast, all who speak with Gullah accents or in Gullah itself, the cadence of the speech also evoking this world. Day is fantastic as Nana Peazant, a woman tied to her past and working to save it for her descendants' future to keep their ancestors with them. Barbara-O, Rogers, Moore and Bruce are also excellent in their distinct roles, making each of their characters both an archetype and their own woman. I will say that Daughters of the Dust may not be for all. The languid pace, visuals and accents may scare off people or test their patience. This is not a film to watch as pure entertainment. It makes one think but at times one may struggle understanding either the language or the style. It may be too mystical and poetic for some. 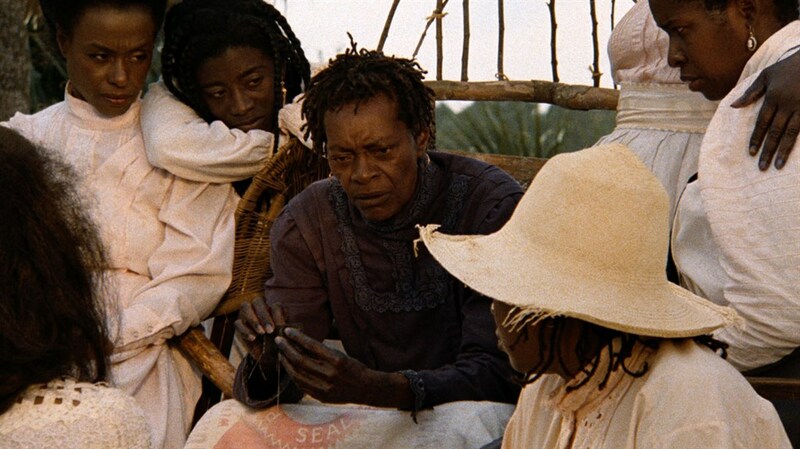 On the whole though, Daughters of the Dust is a film to be seen as one that celebrates and commemorates the past, present and future of the African-American experience and of African-American women in particular. Visually arresting and poetic, Daughters of the Dust is a great achievement.